Director David Chen and Subject Stephen Tobolowsky will appear in person. You may not know Stephen Tobolowsky’s name, but you’ve seen him in countless movies and television shows. Maybe the hardest-working character actor in show business today, Tobolowsky has been the “Hey, it’s that guy!” scene stealer in everything from MISSISIPPI BURNING to GROUNDHOG DAY, from Deadwood to Glee. 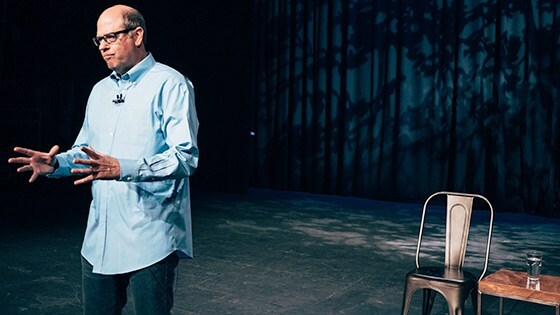 What you also may not know about Stephen Tobolowsky is that he happens to be a phenomenal storyteller, famed for spinning long, autobiographical yarns that were the secret highlight of Hollywood parties and backstage gatherings for decades. In 2009, he started a massively popular podcast, The Tobolowsky Files, which was picked up by Public Radio International in 2012. Tobolowsky’s long-form, richly detailed tales from a life in the arts weave in topics ranging from his Texas childhood to the forefront of scientific research. They are rich with humor and hard-learned life lessons, making the personal universal. Hearing Tobolowsky’s stories is one thing; watching him live is entirely another. (Just ask IFFBoston patrons who attended his benefit performance at the Coolidge Corner Theatre in February 2012.) THE PRIMARY INSTINCT was filmed last year at Seattle’s historic Moore Theatre. Directed by Tobolowsky Files cohost David Chen, the film harkens back to Spalding Gray’s SWIMMING TO CAMBODIA, documenting a singular artist at the peak of his powers. It’s Tobolowsky’s most expansive and most deeply moving tale yet—all about love, loss, and the way we tell stories to make sense of our lives.